Part of the cufflink/jewelry box included some of my grandma’s jewelry. This was made from a necklace that was these beads with gold tubes. 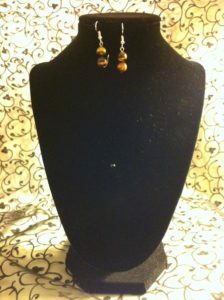 I’m still trying to figure out what to do with the gold, but in the meantime, I made these brown earrings. Currently my only pair of brown earrings. What started as “On the Clock Crafting” during down times at work has turned in to Emrose Crafts.